Just after the taking of Sfax, the heat being very great and the people of Sfax being so preoccupied by the recent events that they were neglecting their fishing as well as everything else, so making the Mediterranean for the moment a shipless sea, it occurred to “M. J.” and a friend to go out into the open and bathe. For this purpose they took an Arab boat, but finding no oars, they appear to have taken the handles off a stretcher, used for carrying the corpses of the Arabs killed during the recent bombardment, and to have somehow manufactured a pair of temporary oars. It is, perhaps, not to be wondered that, that when the companions got near the shore, they jumped off that uncanny boat, and ran for their lives. What do we make of this curious tale? Rock showers or stone-throwing poltergeists, depending on how you interpret the phenomenon, are a cliché of the paranormal genre. I’ve almost stopped collecting these stories unless they have some unique feature. However, the common element of nearly all stone showers is that they occur on land. I’ve been searching for a case I recall of a sailing ship being showered with stones, with no success. Still, I think I’m correct in saying that sea-going stone showers are exceptionally rare. These stones fall into the even rarer class of phantom falls or possibly into the utterly mythic category of “illusory lithobolia appearing to a single polt vector.” The readers of Light would probably have suggested that the witness who saw the falling stones was a medium unaware. 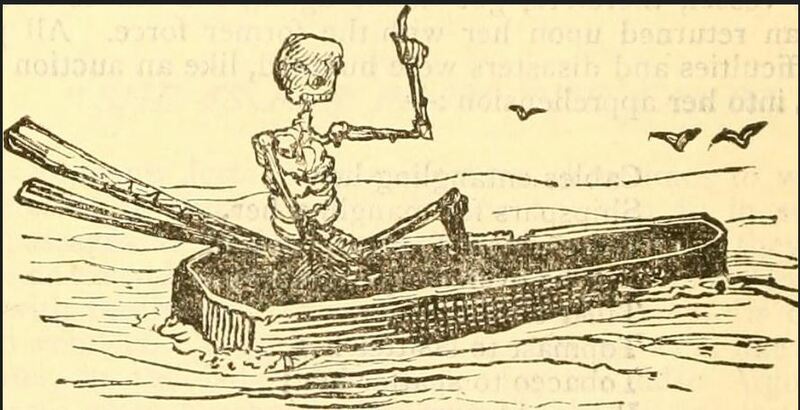 The story is ambiguously titled “The Haunted Ship.” Is that the row-boat or the abandoned sloop, prototype of Ghost Ship and its horror-movie ilk? (“Don’t open that hatch!”) There are hints of djinn-ery: stones visible to only one hysterical witness; an undamaged boat full of water; the immense sailor’s knot and the rope attached to the sea floor (was there an anchor?). These could point to angry spirits or even angrier Tunisians hiding on or around the sloop. It seems unlikely that the calm sea filled the boat to sinking point. But using oars made from corpse-carrying stretchers was probably not the wisest choice.